Waffles can be made in different shapes and sizes, from round, to square, to rectangular, to even heart shaped. But what they all have in common is that unique honeycomb surface which comes from cooking the batter in a special "waffle" machine (iron). Now the honeycomb pattern (or grid) can be large or small depending on the type of waffle machine you use. A "Belgian" waffle is quite thick with a large grid pattern and deep indentations. A "regular" (or standard) waffle is thinner with a smaller grid pattern and therefore more shallow indentations. But no matter which type of waffle you make they all have a bread-like flavor with a crisp outside crust, yet inside they are wonderfully soft and tender. Waffles can be served any time of the day. Excellent for breakfast, brunch, or even as a light supper. They also make a very nice dessert. Ideas for toppings include a pat of butter with a drizzling of maple syrup or honey, jam, fruit sauces, chocolate sauce, and even whipped cream and fresh fruit. When buying a waffle machine (iron), you have so many choices. There are a lot of different brands at various price points, plus you have the choice of either a Belgian or standard waffle machine. And while the electric waffle machines are most popular, there are stovetop models which are especially good when camping. Waffle machines consist of two metal grids, facing each other, that are held together with hinges. If possible buy one with a non stick surface as it prevents the waffles from sticking and also makes clean up a breeze. Always preheat your waffle machine. If there isn't a "ready" light than test to see if it's hot enough by sprinkling a few droplets of water onto the hot surface and the water should bounce and sizzle and then evaporate. Most of the time it's a good idea to grease or spray the grids with a non stick vegetable spray (depending on manufacturer's instructions). Then pour enough batter (about 1/3 to 1/2 cup) (80 ml to 120 ml) into the center of the iron to cover the grids, smoothing out the batter with a heatproof spatula or with the back of a spoon. Then close the second metal grid over the batter and cook the waffle (usually about 3 to 5 minutes) until crisp and golden brown. As the waffles cook you will notice a lot of steam escaping from the sides of your waffle machine, and this is normal. Waffles: In a large bowl whisk together the flour, baking powder, salt, and sugar. In a separate bowl whisk together the egg and milk. Add the egg mixture to the flour mixture, along with the melted butter, and stir (or whisk) just until combined. Preheat your waffle machine. Then, depending on your machine's instructions, you may need to lightly grease (with a flavorless oil) or spray the grids with a non stick vegetable spray. Spoon or pour about 1/4 to 1/2 cup (60 - 120 ml) of batter (or amount that is recommended in your waffle iron's instruction book) onto one side of the hot waffle iron. Take the back of a spoon, or small heatproof offset spatula, and smooth out the batter. Close the lid of your waffle machine and bake until brown and crisp (about 3-5 minutes). It is best to serve the waffles immediately. If not, place the waffles (directly on the oven rack) in a 200 degrees F (95 degrees C) for up to 30 minutes. Waffles can also be frozen. Once the waffles have completely cooled, wrap in plastic wrap and place in an airtight freezer bag. They can be stored in the freezer for about a month. To reheat, preheat oven to 350 degrees F (180 degrees C). Place the still frozen waffles directly on your oven rack and bake for about 5-10 minutes, or just until they are heated through. 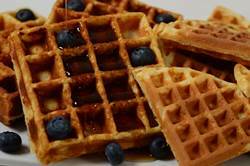 Waffles are delicious when served with butter and maple syrup or honey, jam, or fruit sauces (blueberry, strawberry, or raspberry). They are also very good when served as a dessert with fresh berries and whipped cream. Makes about 4 - 4 1/2 inch (10 cm) square Belgain waffles, or 4 - 6 1/2 inch (16.5 cm) round regular waffles. Preparation time 15 minutes.